What’s SUP? The Stand Up Paddleboard craze is sweeping the world. It’s about time you joined in the fun! 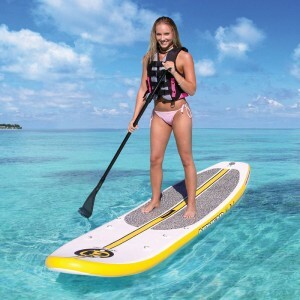 AIRHEAD’s inflatable SUP measures 10 ft. 6 in. and is the best quality your money can buy. The extra rugged drop stitch construction allows a much higher air pressure than other inflatable technologies. Thousands of tiny threads connect the top and bottom layers. Consequently, it can hold 15 pounds of air pressure, more than double the working pressure of other technologies. When you’re out on the water, Na Pali is rigid and will perform like a fiberglass board. A large anti-skid EVA pad provides secure footing. Strap your gear to the 4 D-rings up front. Three removable fins ensure straight tracking and precise maneuvering. Feel like sitting down? Install the seat in seconds and paddle kayak style. For convenience and portability, a backpack with mesh panels is included for stowing and carrying the SUP and all accessories. Accessories included: backpack w mesh panels, adjustable seat, high pressure hand pump, anemometer, valve wrench. AIRHEAD Adjustable SUP Paddle sold separately.